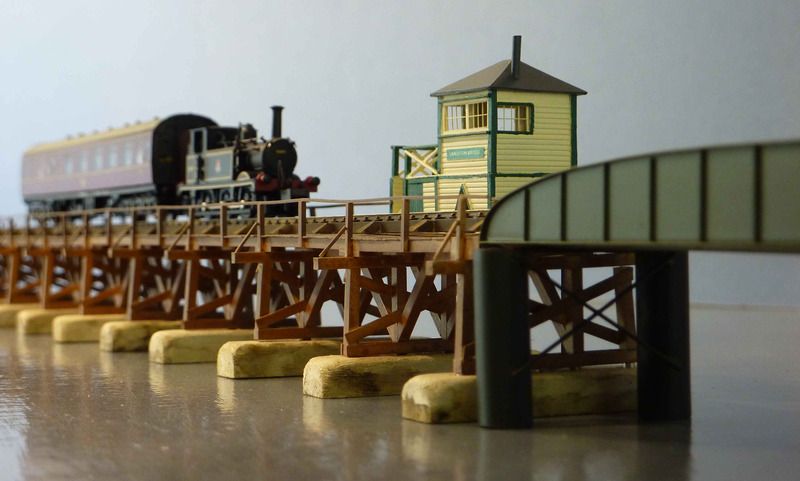 Here are a few photos of my N Gauge model of Langston Bridge. As ever, click the image for a more detailed picture. 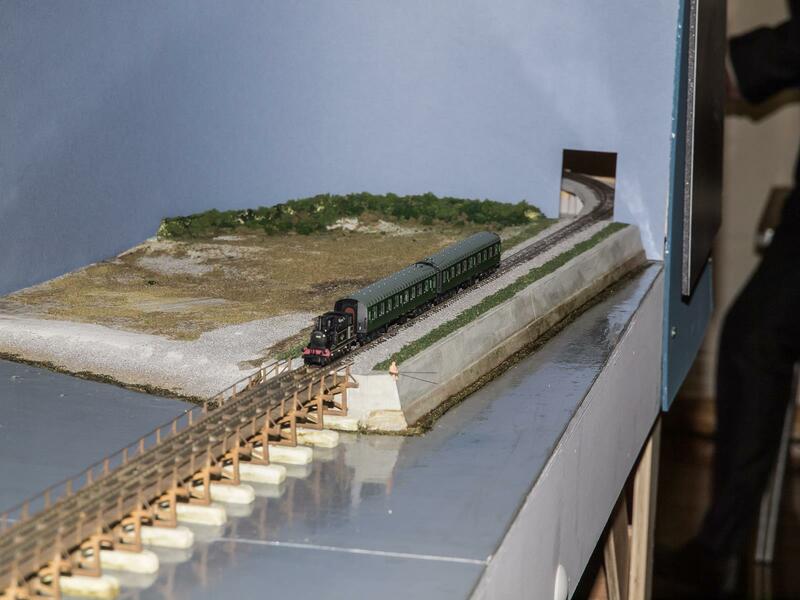 The layout's first outing, on display at the Hayling Island model railway exhibition November 2013. 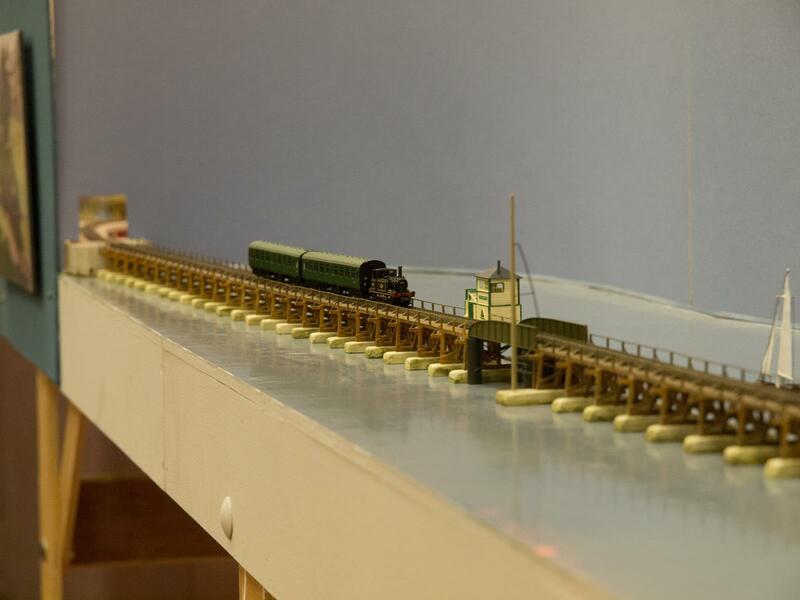 The layout is an exact scale model of the old wooden bridge that linked Hayling Island to the mainland. The line was closed in 1963.The right hand end of the model, as viewed from the front, represents Hayling Island. Trains from the left come from Havant. 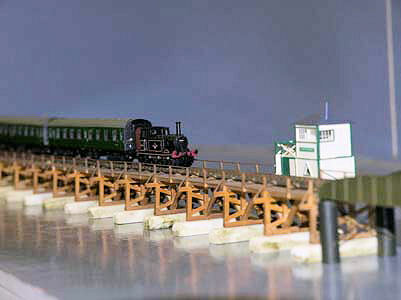 The swing bridge, in the centre, opened to allow small boats through. 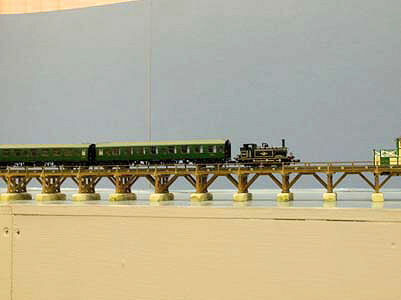 The bridge was very lightly constructed, so only the light weight Terrier locomotive could be used on the Hayling branch line. The bottom of the vertical bridge supports were encased in concrete to provide additional protection from the sea. The concrete blocks can be seen to this day. 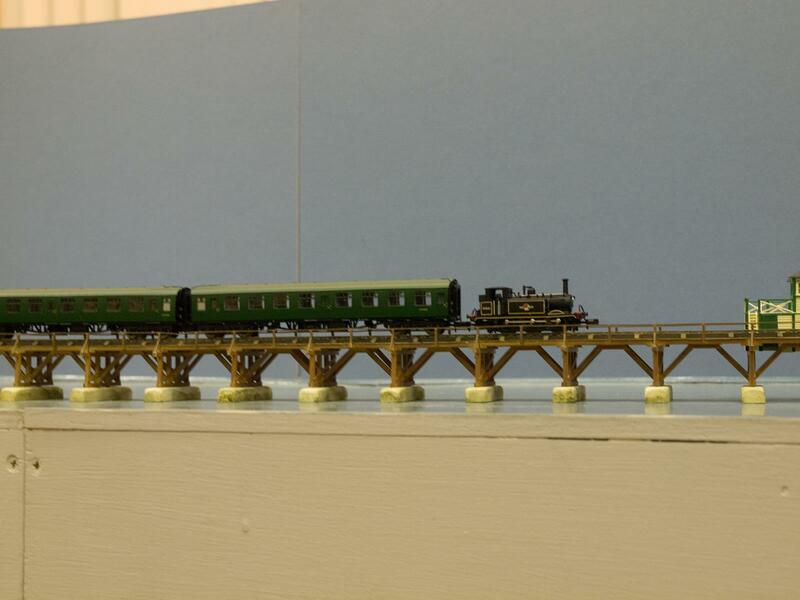 The track on the bridge section is entirely handmade, because the rails are laid on lateral timber beams with spacer cross members. There are about 1200 individually threaded chairs. The bridge is constructed entirely out of Plastruct strips. The picture above shows an initial test section, including the handbuilt track (minus the chairs and a few other details.) 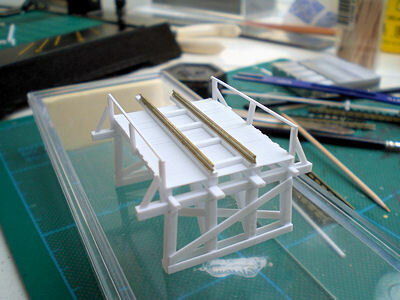 The bridge deck is made of individual thin strips of Plastruct to represent the cross planking. 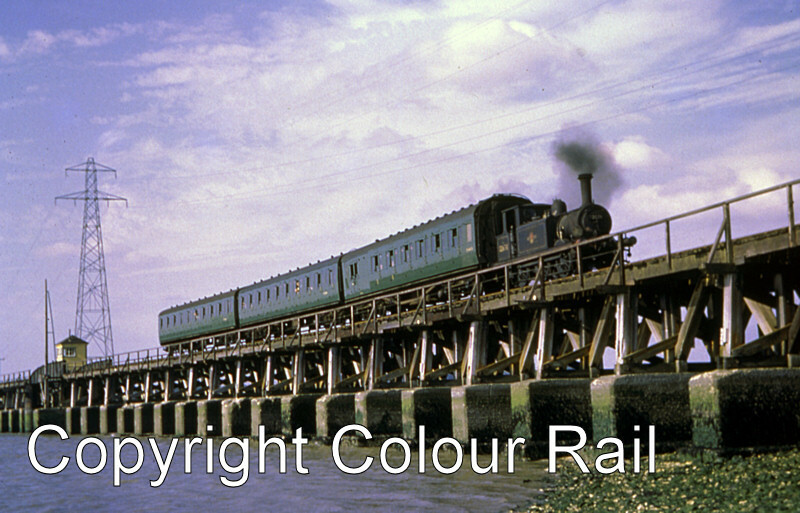 4th May 1961. 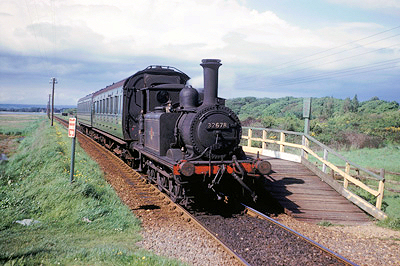 Ex-LB&SCR "Terrier" class A1X 0-6-0T No. 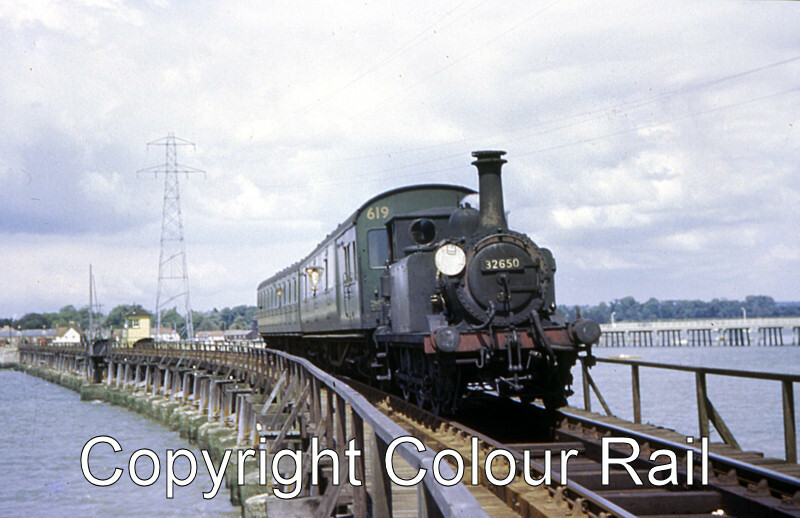 32678 pauses at North Hayling station with a train from Havant to Hayling Island on the afternoon of Thursday 4th May 1961. Photograph by D.E. White. 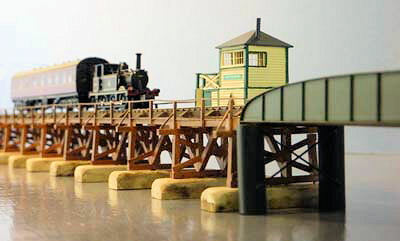 32678 was originally class A1 introduced by Stroudley in 1872 -1880, this engine being built at Brighton Works in July 1880. The class was modified to A1X from 1911. 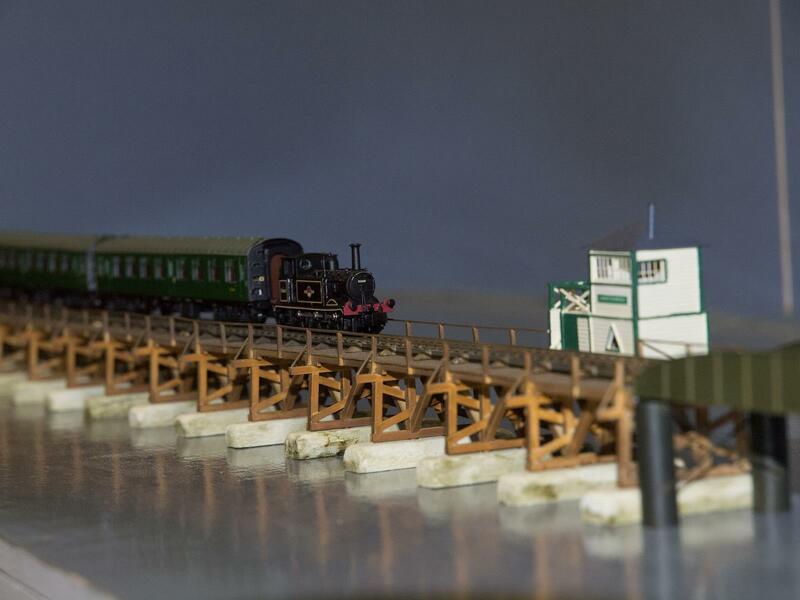 This engine was originally named "Knowle" and carried the name "Bembridge" whilst later working on the Isle of Wight. It was returned to the mainland and withdrawn from service in October 1963. It was one of several that made it into preservation and is still in working order some 128 years after being built. 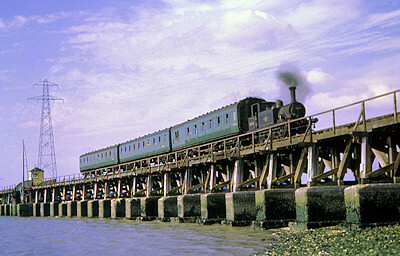 The Hayling Island branch was closed in 1963, being worked by A1X tanks right up until the end. 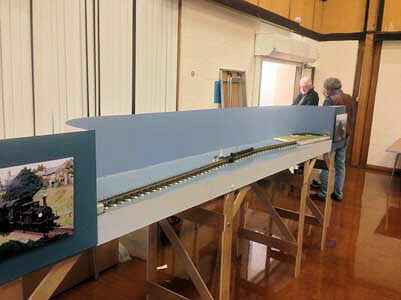 Reproduced with kind premission of Geoff Plumb. Copyright Geoff Plumb.